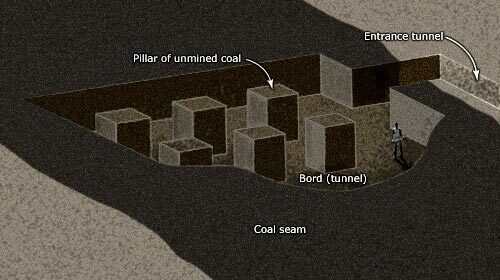 This diagram shows the traditional method of bord and pillar mining. Miners first extracted coal along roadways or bords, while the coal in between the bords acted as pillars holding up the roof. Then the outer pillars were mined, leaving the roof to collapse in a controlled way as miners retreated to the exit.